I’m now selling Men’s clothes on eBay and figured I’d just quickly update this with some of my sources I use when listing items just in case I forget what type of style an item of clothing is. I’ve decided to do a post for men who just want to look good but don’t have the money. The last thing I’d ever advise you to do is spend your last £200 on a suit. Make sure you stay in your financial lane, even if that means building an outfit for £60 – it is possible trust me. Always be on the lookout for low budget stores or the next sale at your favourite brand and sign up to newsletters. I know shopping on a budget can be frustrating and annoying but it is what it is, try to remain patient and it will get easier. All of the stores mentioned in this post are specific to the United Kingdom unless you intend on getting them delivered to you. With that being said there will be near identical stores in your country, exact same products and prices with a different name so be sure to check them out. I must admit I consider myself to be on a modest income so I definitely am not above shopping in these low budget stores – sometimes. As the name suggests, Poundland is a piece of land in which anything and everything on that land is priced at £1. It’s well known in the UK and in recent years has grown from strength to strength, with stores popping up everywhere. They once sold ties, still do sell some underwear and all their stores definitely sell socks. Obviously due to the price, it’s seen as a poor mans store so beware before you brag that your boxers only cost £1. As mentioned previously, I’m pretty sure every country has their own kind of stores in which everything is sold at the same really cheap price – so be on the look out. Primark is well known in the UK for being the huge cheap shop no one wants to admit they shop at. They are averagely good at everything, you can’t expect too much of their products. They are pretty much everyone’s go to place for underwear and socks. My favourite thing about Primark is their incredibly cheap suits, it’s a well made suit with cheap material sold at around £40 for a two piece. This is no exaggeration when I say you could pick up a full two piece suit, with shirt, tie and some black office shoes all for £60. Please note that on the weekends the ques in here are ridiculous so I advice going there during the week. Next is definitely one of the biggest retailers there are, they sell everything, men’s clothes, women’s clothes, children’s clothes and even home furniture. Truth be told, their menswear range is the very opposite to my taste, I find them very basic and standard. They have a very small range of shoes, definitely not their forte. Their clearance is the best time to shop there, you can pick up some amazing blazers for dirt cheap. Usually this is because the trousers would sold out or only have really huge or slim waist sizes. Next also have a really good online store, it’s pretty spot on and they have massive stock. TM Lewin might come as a surprise inclusion on this list as it looks like a very expensive store, well it is. TM Lewin is mainly aimed at corporate lads with navy suits and pink shirts on huge salaries. The average suit here will cost you around £250, with shirts costing £35 and ties costing around £25. With that being said they have earned the right to those price points as without a doubt, they have lead the way in the last 100 years and have almost become the benchmark for quality. If you’re reading this wondering why I would include such a brand on my list, the answer is simple; their change of season discounts. Between the months of April to June and October to December they start to dump all their stock that didn’t sell as they expected and £40 shirts are sold at £15 – bargain! After shopping here for five years, I’ve loved every purchase except their socks, they lost elasticity within a month, wasn’t impressed. This is going to sound funny but I’m being serious, I picked up three pairs of black socks for £1. I’m actually wearing them now. They are comfortable, have a decent colour and they are cheap as chips, or even cheaper. In 2010 I picked up a suit for a work event I went to. Cost me a whopping £35 for a two piece black suit. I also picked up some black shoes for £8. Not bad right? I have had over fifteen suits from Next, no exaggeration, many of which I still own and its hard to pick an out and out favourite. For the sake of this, I’ll go with one of my go-to suits when I need to impress – the blue pin stripe suit. The suit is a poly-blend suit, nothing special, but looks fantastic, has great colour, I’ve owned it for three years and it cost me a modest £110 for the jacket and trousers. I have and always will rant about my twill pink oxford shirt from TM Lewin, I’ve had it for over two years and it’s served me well. However it cost £35 so you would expect it too. For that reason my favourite shirt from TM Lewin will have to be my non-iron summer shirts I bagged in the winter of 2015. I remember seeing these online and thinking “what the hell – £15.” Since it was November and no one wanted to wear summery colorful shirts they were on sale from £35 to £15. I grabbed three . Without a doubt; a brilliant bargain, brilliant quality and my favourite buy. Wherever you live and whatever shops you have available to you, you can apply some of these tips to suit you. When the season changes as it is now, have a look at all the winter clothes, the jackets, scarves, gloves, wool or denim shirts. No one wants to buy thick clothes now when they’re expecting hot sunny days, I’m in England so I wouldn’t bet on it too much. Also be on the look at in the sales section of your favourite websites. Check in your local “pound shop” and see what they have to offer. Enjoy the budget shopping and if anyone asks; you paid top dollar for it. Deciding what to wear to work can be difficult sometimes. Every workplace operates slightly differently, while some employers want top-notch fashion savvy employees while other employers would rather you come to work in jeans. You can broadly put each type of business in two categories. These types of workplaces are the most common, a place where employees should wear a two piece suit and a dress shirt. Some employers want a tie worn at all times, some don’t mind without the tie and some don’t even mind if you leave your blazer at home. Formal attire is very restricting, your trousers must match your blazer. Your tie must be a sensible width and length. There are many rules when it comes to dressing formally, and this is to be expected since most of the multinational companies operate based on a set of strict rules and regulations. As long as you fit somewhere between a three-piece suit & tie and dress shoes/shirt and two piece suit – you’ll be sound. My whole working life I’ve worked in environments where the tie has been a mandatory thing but I was still free to express myself with wild socks and lavish pocket squares. Now for the first time I no longer work in this environment. I work in a very small office now which has meant that the rules of business attire have flipped a bit. Smart/casual work environments range from t-shirts/jeans (Mark Zuckerberg) to the combination of a dress shirt and trousers. Many workplaces that allow casual dress code will expect their workforce to still look smart. While formal business attire is quite rigid, casual business attire has much more freedom. The great thing about dressing casual is the freedom to express yourself and really go all out. You can wear a bunch of accessories and crazy shoes with funky socks. It’s all good as long as you keep the bare essentials. If you don’t have to wear a dress shirt to work then keep your t-shirts and jumpers logo/picture free. Do not come into work with a picture of a half-naked (or even naked) woman on your top or some slogan which involves a bad word. If you do, you may find yourself being sent home to change or asked embarrassingly to take it off. If dress shirts are compulsory, then keep your shirt freshly ironed, wear good quality shirts from somewhere like TM Lewin or Hawes & Curtis. Wear good trousers and don’t slack and wear jeans every time you can’t be asked to iron. Grab some comfortable chinos from Zara for £30, trust me they will do you wonders. If you can get away with trainers you may as well but make sure they’re black or as close to black as possible and not high-tops. Currently my boss has me in limbo, when I started I was wearing a suit, dress shirt and shoes with no tie. Now I’ve left the blazer at home, ditched the shoes and wear plain black vans and a cotton jumper over my dress shirt. I look slightly confused but I’m super comfy and I fit right in with my colleagues. So you think it’s a good idea to buy a new suit and come in looking much better than your boss so then maybe he might think you’re serious about getting promoted? If your boss is a SHE, then it might work, if however your boss is an egocentric HE, it’s definitely a bad idea. You’re on his territory and showing him up is not a good idea. Judge your boss or manager and match them. If you want to look a bit better than them, go for it, but don’t over do it. So What’s The Correct Business Attire? Depends where you work. As a botch standard, stick to a two piece suit with minimal accessories and a tie that matches the width of your suit’s lapels. Wear the best shoes you own and hope for the best. Just remember, the first time you show up anywhere, it’s better be overdressed with a lavish pocket square bursting out your chest pocket than have a mickey mouse jumper on when everyone’s dressed like the cast of wolf of wall street. TOP TIP: Look around and copy, don’t over do it & don’t blend in – balance is key. TM Lewin Clearance Shirts – £15 Each! Like everybody else, I’m strapped for cash at this time of the year. I’ve dug way too deep into my pockets and spent way to much money on way too many things I shouldn’t have. However, it’s time for me to dig a little deeper. TM Lewin are truely a great company. Hawes & Curtis are doing well to compete with them but outside of these two, it becomes hard to name another brand doing so well in Men’s shirts. Realistically £40 for a really good quality shirt is not bad. Yes you can definitely get decent shirts from places like Next or Burton for half the price. However they lack the quality of TM Lewin & it’s like. This sale is the perfect opportunity for you and I to bag a few quality shirts, beautifully tailored for only 38% of the original price. Why? Simply because they didn’t sell enough over last season – even after all the silly 4 for £100 sales they had. Here’s where we come in and grab a bargain. Be quick to order yourself a pair before they run out of your size. I’d recommend collecting from store, save yourself £5 delivery charges. I just ordered myself the London Fitted Navy Teal Check Twill Shirt. I’d personally recommend these three shirts for the wonderful year we have ahead of us. You cannot make a mistake when it comes to style, style is who you are and what you choose to do with your clothes, so feel free to express yourself in anyway you see fit. However, when it comes to fashion there are MANY mistakes and I mean MANY. Some of the well known “fashion mistakes” I disagree with and this is evident in my own style. There are on the other hand some mistakes you can’t afford to make. Two of which I have seen today and want to try and hopefully prevent you from doing them. Badly fitted suits are horrible, whether they’re too baggy or too tight. Clothes should make you feel comfortable and look good. If you’re uncomfortable, your clothes are probably too tight. If you feel like you’re in bed, your clothes are way to big. I saw some incredibly baggy clothes today. They looked like they were handed down through the generations. I remember when I went to my first interview, I wore my dad’s suit and oh my God, I looked horrible and everyone could tell. If you find it difficult finding clothes that fit you properly, then either branch out of your comfort zone and try out new stores or build a great relationship with your nearest tailor. You’ll be surprised what tailor’s can do. Fast food restaurants want their managers to look the part so they ask them to wear ties. Obviously they can’t wear a tie without a shirt so they get them to wear a shirt. The problem arises when you have someone wearing a shirt, getting sauce and oil all over their sleeves. Which obviously leads to this short sleeve/tie combo we see today. Now unless you’re a manager in a fast food restaurant, why would you ever wear a short sleeve shirt with a tie? Please don’t. The short sleeve/tie combo is associated with low paying jobs and unless that’s the look you’re going for, avoid it. Why Do My Shirts Rip At The Elbow? I’m a proud owner of some beautiful TM Lewin shirts. So proud I’ve ordered some for others and told ample amounts of people to get them. Then out of nowhere – my shirt ripped right above my elbow, the fabric just decided to split and tear. I was so shocked I thought maybe I put on one of my old cheap shirts by mistake. I always thought only cheap shirts rip and quality/luxury shirts last a lifetime. In all my previous jobs I was always out & about and now working 9-5 on a desk, I’m a victim. If this has not happened to you, then I’m guessing you probably don’t have an office/desk job. You may be asking – Why Do My Shirts Rip At The Elbow? Does This Mean My Shirts Are Low Quality? Why they rip is pretty easy to answer, the area under your elbow will be the most worn out part of any shirt. Every time you bend your elbow, you stretch all the fabric and the shirt will get more worn out as the day goes on. On top of this constant flexing, everyone that sits at a desk puts their elbows on the desk. Using a mouse or typing on your keyboard requires some movement which will slowly ruin the elbow area of your shirt. To answer the second question, does this mean your shirt is low quality? – it’s a bit more complicated. I find TM Lewin to be among the best quality shirts on the high street and still my shirt ripped. The problem isn’t the quality, it is how thick the material of the shirt is. All fabrics rip after some time, unless it’s some indestructible military fabric. Thin fabrics will rip and tear faster than thicker fabrics – that’s just the way the cookie crumbles. It’s too late for my beautiful blue shirt but it doesn’t need to be too late for yours. Preventing your shirts from ripping at the elbow is not too difficult, you just need to be conscious of the fact this can and will happen to you if you sit at a desk or table often. Blazer or Jacket – Easiest way to stop it is to keep your blazer on, your blazer will be able to handle a beating much better than your shirt will. Elbows off – Keeping your elbows/forearms off of the table/desk is a sure fire way to stop them for tearing. All you have to do is adjust your chair and keyboard/mouse so they are on the edge of the surface and your forearms are in the air. Roll your sleeves – I always roll my sleeves up, mainly because the people I work with live in the 1800’s and haven’t discovered air conditioning yet. Rolling up your sleeves will mean that your skin is free to rub against that table as much as you want it too. Just make sure you have your sleeves rolled up high enough. I found a great article from this blogger, Eileen, on how to fix your shirt – properly! Click Here. I’m a massive fan of TM Lewin as I’ve mentioned a million times and I’ve decided to order myself some more of their Twill shirts. My blue shirt that ripped was a Poplin shirt which like their Twill shirts it’s made from 100% cotton. The difference however is Poplin shirts are great for summer as they are thin and light. The Twill shirts are a lot thicker which is great for me as I know they’ll last a lot longer. Considering my blue Poplin shirt only lasted me five months, I’m hoping to get a good eighteen months out of my Twill shirts. Only time will tell. That is the question, well at least one that I have been asked a lot recently. It would be very easy for me to brush off this question and just simply say; no don’t go to Primark . That would definitely be a contradiction on my part, as I was in Primark yesterday, I did only buy a towel and a washing basket but none the less, I’m “technically” a Primark shopper. There are some things that you can buy from Primark that are completely fine and acceptable, such as; homeware and underwear. Primark is fantastic for essentials like bedding, socks and t-shirts and I would definitely go there to buy them. I’m not really one to buy a plain blue t-shirt for £30, but I am happy to pay £4 for one at Primark. Apart from underwear and things for the house, you should not really be stepping foot in Primark . Items to avoid are the ones that stand out in your outfit such as a suit or a shirt that people would notice often. With Primark you can really see the low quality in items like suits, shirts and ties. When you compare a Primark suit to a suit from anywhere else you get the feeling something is wrong, it looks like the Primark suit has been stuffed into a box and shipped from Turkey to Britain. Take a closer look at the shirts and ties and you will see threads hanging off everywhere and they lack massively in colour. If you are either of the above, then scrap everything I wrote previously in this post. Not having any money spare to have an expensive or quality wardrobe is not a bad thing, it’s just a part of life that most of us have been through. Primark can be a great place to build your wardrobe on a tight budget so feel free to spend the little money you have available on a Primark suit or shirt. This is a strange tip because everyone knows how to tuck in their shirt, we have been doing it since we were kids. I guess the right title for this tip is; how to properly tuck in your shirt. You might be thinking what exactly do I mean by properly and who can say which way is the correct way. The correct and most proper way of tucking in your shirt is the way that looks the best and smoothest. Let me make this clear; muffins are amazing but looking like one is horrible. When your shirt puffs out and kind of hangs over your belt you look like a muffin. This must be avoided at all costs, but how? This usually happens for two reasons, which are both easily fixable. Usually because your shirt is too baggy and loose fitting or you are wearing a t-shirt underneath your shirt which is causing your shirt to puff out, making you look like a muffin. Whatever you want to call it, a baggy shirt simply isn’t pleasing to the eye. If like me you have a bulging belly sometimes you still need to wear a well fitted shirt, even if it means you got to cut down on dessert after lunch. If you currently can not afford to purchase some new slim fitted shirts then you can use the military tuck. 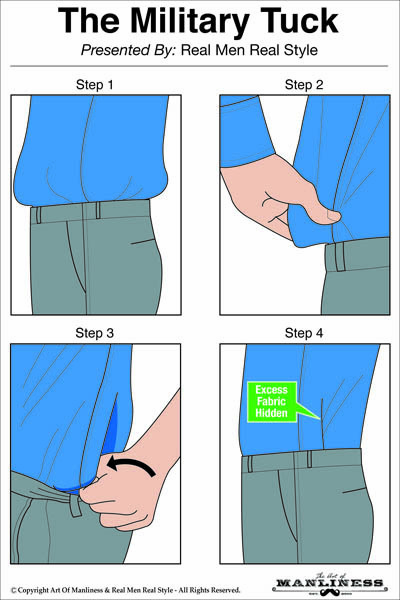 This, simply put is an easy way to tuck in your shirt by grabbing and pinching the sides of your shirt and folding them over and tucking your shirt in. It’s really simple and works like a charm, just follow the image below. Even if you have a well fitted shirt, if you wear a baggy or loose undershirt, it will cause your shirt to look messy and if the undershirt is not long enough in length you will get the muffin look. You have two options; wear a very thin, well fitted and long undershirt or do the underwear tuck. Undershirts are amazing but finding a quality one is quite difficult. I prefer something light with a v-neck cut so if I wanted to wear my shirt without a tie, the undershirt wouldn’t be shown. Wearing one that can’t be seen underneath and is so soft and comfortable you can’t even feel it – is a real gem. I own and recommend this uniqlo undershirt. The underwear tuck is fabulous, when getting dressed in the morning simply tuck your undershirt into your boxers/briefs. It might feel a little weird at first but trust me it works like a charm. As the day goes on you’ll get used to it and you’ll realise your undershirt hasn’t moved place. I hope this has helped, these are the techniques I use and if you have any of your own feel free to drop me a comment below or send me over an email. Good luck with the military and underwear tuck. I’m in London for the weekend visiting my parents and considering it was just pay day, obviously I had to do some shopping. After spending all day on Oxford Street, I decided I would compile a list of all the great clothes and accessories I saw throughout the day. Most of this list, I either already own or just bought today and I’m hoping you will find as much joy and benefit from these products as I do. On my trip down to London I realised I left my cufflinks at home in Birmingham, considering the only shirt I brought with me was double cuffed, I was screwed. Thankfully the weather on Saturday was fantastic so I just rolled my sleeves up and went shopping. I found myself in TM Lewin looking at cufflinks and then I remembered they sold those silly pretend cufflinks and figured for £4 – why not? So these are now my easy to carry cufflinks. If you wear a dress shirt to work then you know how useful undershirts are, not only do they stop your shirt from being ruined by your sweat in the summer, they keep you warm on those not so hot days. The problem is if your undershirt is too loose fitting or not long enough, it can cause your shirt to look cheap and baggy. This is easily solved with the best undershirt I’ve ever owned and seen. Uni-qlo’s undershirt is literally the thinnest item I own, its so comfortable and tight fitting I barely know I’m wearing it. The length is amazing dropping right down pass my boxers meaning it will never become un-tucked no matter what I do. I bought mine in white but it’s available in about eight different colours. With Summer basically here you really have no excuse now not to be rocking some dapper loafers. I’d definitely go for a slip-on loafer with the tassels. Loafers are fantastic for looking casual in a suit, especially when worn without socks. On Saturday I grabbed myself some decent loafers for £60 from Zara. Us gentleman that wear shirts all the time and look after them properly know that you have to take out your collar stays whenever you wash or iron your shirt. Just incase you don’t know, if you don’t then you will ruin your collar and possibly melt your collar stays into your shirt. So since we are constantly removing our collar stays it is very possible that we may lose them. I’ve lost about five in the last three months. As an aspiring gentleman you should look after your clothes and buying some replacement collar stays is a great insurance item for you. Black shoes are few and far between. Many men just wear any sort of black shoes and just expect them to go un-noticed. Your shoes are ridiculously important and every that cares about you will notice them. This June it is probably best you put away those battered black shoes and get yourself a new professional pair. Schuh is a great company to buy from, they have some good brands under their belt and are definitely a great retailer to check out. Base designed these shoes and they are both comfy and very stylish with a slight bump along the front of the shoe to create that perfect work look. Buying a new shirt is something you should do every so often, at least once a year. I love shopping and summer is a great excuse to buy a new shirt. As it heats up you spend more time with your jacket/blazer off and more time showing off your shirts. Since people are going to see it a lot more the next couple months, it makes sense to wear fresh shirts. TM Lewin is a heavyweight in the luxury shirts industry and definitely without a doubt my favourite shirt retailer. Grab your next shirt from them, you will not be disappointment- I promise. I do not remember the last time I bought an item for full price, the only time I would ever do that is out of desperation. Why would you? There are discount codes and vouchers all over the internet. Although to be honest some companies like TM Lewin are pretty good at keeping them hidden. Luckily for you guys, I’m here. Just Enter MARCH10 at checkout and you got yourself 10% off anything online.